CET treatment has proven to be effective in clinical settings. The section below summarizes results from an open label study(1) of patients with diabetic peripheral neuropathy as reported in the April 2012 Journal Of Practical Pain Management. The study objective was to measure the treatment's effect on pain and the quality of life. The researchers selected for analysis 101 patients reporting neuropathic pain and other symptoms and who completed the treatment protocol for the entire study, which covered an enrollment period from May 2008 through July 2010. The study group was divided between 58 females and 48 males. The mean age of study participants was 66.5 years with a rage between 31 and 87 years old. Of the patients enrolled, 68% had type 1 or type 2 diabetes and 32% had pre-diabetes. Each patient was asked to fill out two surveys pre and post treatment. One involved a self rated pain score on a scale of 1-10 with ten being extreme pain. The other involved an overall quality of life improvement number on a scale of 0-100 with 100 as a very high quality of life. 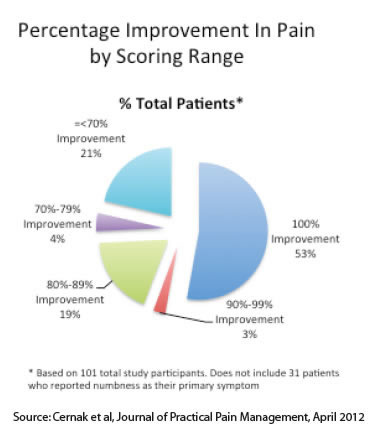 In reporting the results, the research team noticed that 31 out of the 101 patients reported numbness and not pain as their primary symptom. Accordingly, they split the results for pain reduction and improvement in quality of life between the two groups. For all patients, the overall average pre-treatment pain score on a scale of 1-10 was 5.39 and the average post-treatment score was 0.98. This amounted to an 82% reduction in symptoms. 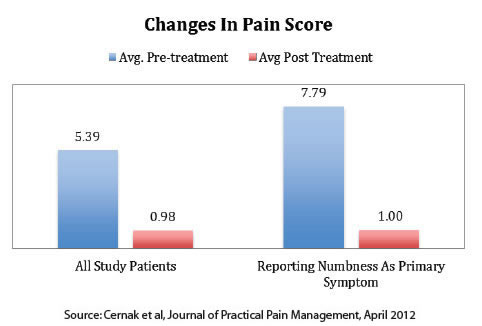 For those reporting numbness as their primary symptom, the overall average pre-treatment pain scores came to 7.79 and the post-treatment came to 1.0. This amounted to an 87% reduction in symptoms. The study further broke the results down by self-estimated percentage improvement in pain. The chart below shows the results with those reporting numbness as their primary symptom excluded. 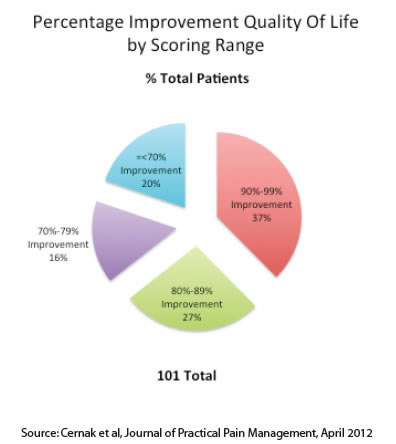 Overall, 79% reported an improvement score greater than 70%. As of the time the study was performed, 21 of the 101 patients evaluated were 1 year or more post-treatment without relapse of pain symptoms. The study also asked participants to rate the improvement in their overall quality of life as a result of the treatment. Benefits included better pain free sleeping, balance and walking along with an enhanced ability to exercise. A summary of the study results is shown in the figure below.